Husky 30 gallon air compressor is the most popular air compressor. And model C302H is the latest one at the current time. It has a lot capacity of air tank, quality powerful motor and low price compared to the similar compressors of other brands. It delivers 6.2 SCFM at 40psi, 5.3 SCFM at 90psi and maximum pressure is 155psi. Husky 30 gallon air compressor equipped with 1.6 HP induction motor and V-twin cylinder oil pump. It has a lot cast iron parts for long life. Almost all customers says that this is the quietest 30 gal air compressor. Its noise level is only 75 dBA. Its just a little louder than vacuum cleaner which noise level is about 70dBA. Also it doesn’t vibrates when its operating, it is just rock steady and it doesn’t shake. 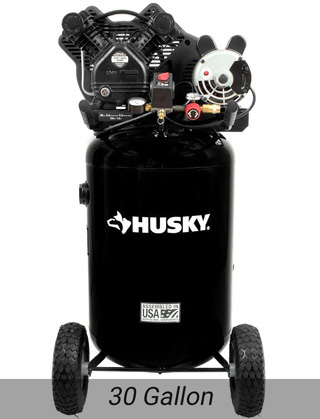 This Husky 30 gal air compressor has almost the same weight as Husky 33 gallon air compressor. Its weight is about 148lbs. Also it has 10 inches pneumatic wheels and handles. And due to all these you can move it in any place by yourself without additional help. This air compressor will not steal your free space at the garage due to its vertical design. As this is oil-lubricated air compressor you should check the oil level every time you start to work with it. It took about 7 minutes to fill it up to full air tank and maximum pressure. This Husky 30 gal compressor is assembled in the USA and it comes fully assembled and equipped with quick-set regulator, quick connector, two pressure gauges, and on/off switch for ease of use. if you need more info about Husky air compressor parts check here. Delivers 5.3 SCFM at 90psi. Overall if you are looking for the ultra-quiet and at the same time powerful air compressor for home or garage use which will give you a lot compressed air and doesn’t steal to much free space at your garage, this one can be the good choice for you. Do not forget to read the user manual if you have any questions during use. If you want to write a Review about this C302H model, you can use the form below.